My grandfather was a cancer researcher who faced shortages during World War II and had to improvise to keep his lab going. When he ran short of quartz lenses he remembered hearing that plastic also transmits ultraviolet rays and filled synthetic sausage casings with water to create a perfect—much cheaper—substitute. 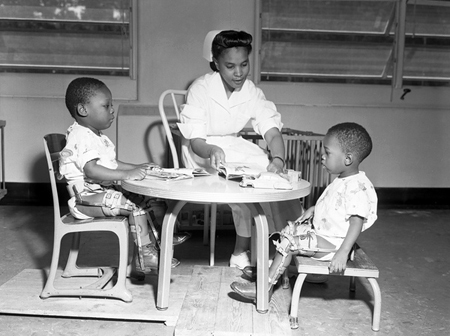 Nurse Grace Kyler working with young polio victims at the Florida A&M University Hospital in Tallahassee, 1953. Courtesy State Archives of Florida, Florida Memory. More recently, people living with diabetes have used open source software to link off-the-shelf insulin pumps and continuous glucose monitors to simulate a working pancreas, sharing their designs online so others can benefit. People are experimenting, creating, and sharing their prototypes, gaining feedback and followers to improve their work and expand the market for it. As the Chief Technology Officer at the U.S. Department of Health and Human Services, I brought entrepreneurs and health hackers into our work in the federal government because I believe that we must build an “innovation nation” that combines our old-fashioned, can-do spirit with newfangled technology. That’s why I’m excited to interview Tiffany Kelley and Anna Young on March 16 at the Lemelson Center. Tiffany Kelley is a nurse who saw her colleagues writing details about patients on scraps of paper, Post-it® Notes, and even paper towels throughout their shifts. The nurses would then verbally relay this vital information at shift changes, introducing an unnecessary risk of forgetting a detail or misreading a scribbled, smudged note. She decided to bridge this communication gap with a nurse-focused app called Know My Patient. Anna Young helped build the first makerspace in a hospital, at the University of Texas Medical Branch in Galveston, where nurses are given the tools they need to prototype and build solutions to clinical challenges. 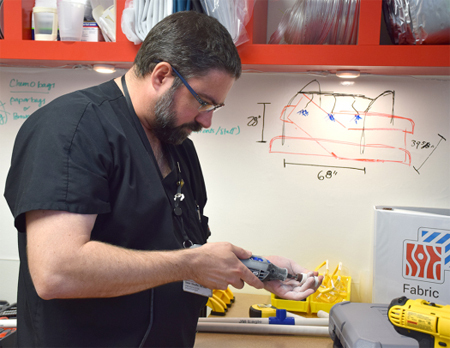 Burn Unit Nurse Manager Jason Sheaffer working on a prototype of one of his ideas to improve nurse efficiency and patient care in the MakerHealth Space lab. Courtesy University of Texas Medical Branch. For example, Jason Sheaffer is a burn unit nurse who built a portable shower unit with 3 adjustable heads in the hospital’s makerspace. He was inspired by the challenge of treating a victim of a chemical burn, when three nurses worked together for hours, spraying water as best they could, irrigating the skin. It was exhausting and inefficient. Now, with this invention, nurses can direct the nozzles where the water is needed and be free to care for the patient in other ways. Barriers to entry are being lowered in communications, design capabilities, and manufacturing. Collaboration across time and space is now possible. What will happen when everyone has access to the tools and information they need to solve their own problems — and share their ideas with others? I look forward to exploring these ideas with Tiffany and Anna on March 16. Please join us! Please visit innovativelives.eventbrite.com to reserve your free tickets for Innovative Lives: A Dialog on Healthcare Innovation.